Have a feeling I’ll be reusing this picture a bit.. First instinct was to put the opening line of Fear and Loathing in Las Vegas across it. Might still do that, particularly as the sun hat and arched eyebrow give Mimi a very Hunter S Thompson look – I’m so proud. In case you’re worried, I only ever let her drive when I’ve had a few beers.. Previous Post WHAT THE FOX? How dads read kids’ books. Exactly! 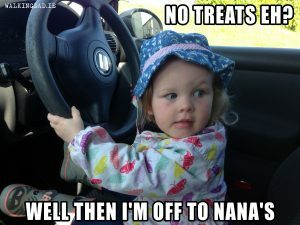 Nana’s have all the sugary treats, load the kids up and then hand them back so you can deal with the crash and burn. That’s part of the grandparent job description – Doing all the stuff we’d have never done with our kids.